Brine shrimp prefer colder temperatures. Do brine shrimp prefer cold or warm temperatures? a. Allow the brine shrimp sufficient time to move to their preferred position along the gradient and distribute equally. b. Collect data concerning population density at four positions along the gradient. c. Make sure to rinse and dry the thermometer between measurements. 1. Obtain a Petri dish and divide it into four equal areas with a marker and label them with numbers 1-4. 2. Add 50 mL of the brine shrimp solution to the Petri dish. 3. Count the number of shrimp in each of the four areas. 4. Record the temperature for each of the 4 sections. 5. Allow the Petri dish to sit under a lamp for 30 minutes. 6. After 30 minutes, record the number of shrimp in each of the four areas. 7. Record the temperature of each of the 4 sections. 4. Cover 1/2 of the Petri dish with black construction paper so that all of area 1 is covered and 1/2 of areas 2 and 3 are covered. 5. Record the temperature of each of the 4 sections. 6. Allow the Petri dish to sit under a lamp for 30 minutes. 7. After 30 minutes, record the number of shrimp in each of the four areas. 8. Record the temperature of each of the 4 sections. Citation for the above photograph: Brine Shrimp. N.d. Photograph. Brine Shrimp. Web. <http://bestfish.tripod.com/brineshrimp.htm>. What temperature does brine shrimp appear to prefer? Support your answer. In this experiment, brine shrimp do not appear to have any kind of preference as to water temperature. Although, the temperature change was not that drastic. What light level does brine shrimp appear to prefer? Support your answer. Unfortunately, this too is undetermined by the observations. The experiment was unsuccessful in answering the hypothesis, but the class learned about microorganisms, brine shrimp specifically. Do the brine shrimp appear to be attracted to the light, temperature, or both? Support your answer. Again, undetermined. In group two's observations, it is apparent that the shrimp prefer light and warmer temperatures because most of the shrimp are in quadrant 4, the one not covered by the construction paper. But the other groups do not support this theory. Did you have outliers that moved to an area of the plate that others did not prefer? Explain this result. It was difficult to judge if a shrimp had moved or not, because of their tiny size and quick movements. They were something to count too; the entire experiment was hard. The experiment has the potential to be improved if there was an easier way to count them and see whether they moved or not. How can this be applied to other organisms in aquatic ecosystems? Answer the question in a well-developed paragraph. 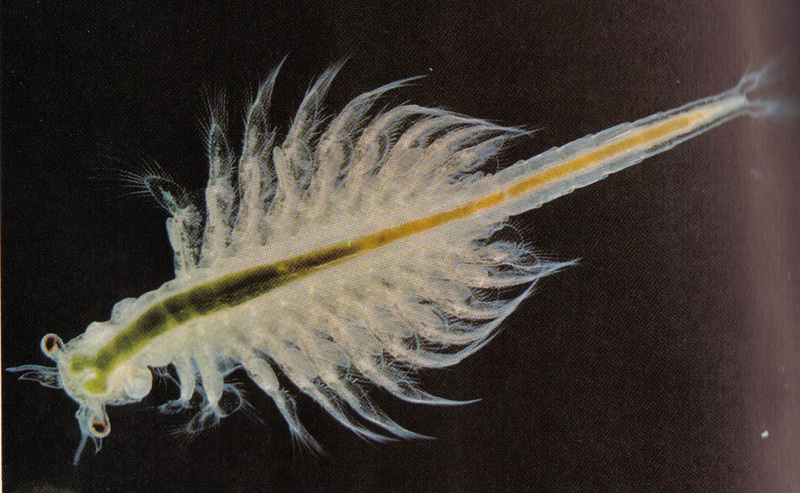 Other organisms that live in the ocean, alongside the brine shrimp, may have similar likes and dislikes. Knowing the shrimp eats algae in its natural habitat, this suggests shallow waters, which means warmer temperatures and more sunlight. Meaning, other organisms like the brine shrimp who eat algae, like the native waterflea, mayfly nymphs, and zebra mussels. All these organisms feed on algae and live side by side. Although, the zebra mussel is an invasive species, currently slowly destroying the Great Lakes' ecosystem. Despite the fact the experiment produced no solid theory, research shows that brine shrimp most likely prefer warmers waters and more sunlight as opposed to colder waters and little to no sunlight. Evaluate your Hypothesis. Even though the experiment did not support or oppose the hypothesis, research determines that the hypothesis was indeed wrong. The thought process was, that brine shrimp, being microorganisms, preferred the colder temperatures because their bodies were too small to withstand the heat from the sun. Unfortunately, this can be proven wrong. Possible sources of error. There were a few errors in the experiment that could be changed for future endeavors. First, if the separation of the shrimp could have been more clear, that would have made the results easier to see. Second, a better developed method for counting the shrimp would have been appreciated and again, would have made things clearer. Third, if the shrimp were bigger, say, adults, when the experiment was performed, they would have been simpler to count. All in all, the experiment needed some tweaks. Application. Microorganisms play an important role in the world's many ecosystems. In this case, brine shrimp feed on algae, which saves the underwater plants from dying. Then, a bigger organism will eat the shrimp and a bigger one will eat that, and so on and so forth. The big picture this experiment paints is the fact that humans are not the center of everything. There are tiny little worlds surrounding us, all almost as intricate and complex as mankind's. Hopefully, this experiment also has affect on other members of society, showing them that sometimes, you have to stop and smell the roses to truly understand how the world fits together.